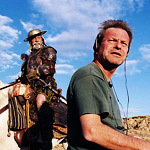 Lost in La Mancha is a short, sweet documentary about director Terry Gilliam’s epic battle to get his version of Don Quixote made. “The most painful thing was seeing reality win out over Don Quixote in the end,” says Gilliam, who could be talking about either the story or his own doomed production. Directors Keith Fulton and Lou Pepe have worked behind the scenes on Gilliam’s sets before. You might find their work as an extra feature on the 12 Monkeys DVD. They had planned to make a television-length “making of” documentary, ever since Don Quixote was in its infancy. Their own cameras were with Gilliam in pre-production, and they were on the set from day one. When a string of unbelievable circumstances conspired against Gilliam’s film, their simple “making of” story became something more interesting. Call it an “un-making of” documentary. Jeff Bridges, who worked with Gilliam on The Fisher King, narrates. The most amazing piece of bad luck happens to Gilliam on day two of shooting. It sums up the sort of luck Gilliam has during the entire production. The crew is shooting in a Spanish desert canyon, when a freak torrential hail- and rainstorm halts production. The crew is able to cover most of the equipment with tarps, but the rain becomes so intense that the site begins to flood. The filmmakers, watching from the safety of their cars, see the boxes of expensive camera and lighting equipment begin to float away down the canyon. The loss of equipment is covered by insurance, but the loss of time is not covered. And it’s not just the afternoon’s work that has been lost, but everything shot to date. To add insult to injury, the rains change the color of the canyons from a dusty yellow to a rich orange, and the footage from before and after the storm doesn’t match. And this is only a representative sample. There are other problems, like the lead actor developing a painful prostate problem, so that he can’t comfortably sit on a horse. Fighter jets fly over the remote location, practicing bombing runs. The only sound stage left in all of Spain isn’t even a proper sound stage, and when the air conditioning comes on, you can’t hear yourself think. It’s painful to see the various pressures squeeze the plucky and amiable Gilliam. He is resilient, but even he gets pushed beyond his flex range. Luckily for us, comedy equals tragedy plus time. Even while sympathizing with Gilliam, it’s easy to find humor in the hand of fate going to such extreme lengths to slap such a nice guy. If there is a lasting deep tragedy in Lost in La Mancha, it is not Gilliam’s own — he will recover and continue his stellar career. The real tragedy is that his brilliant vision — which Lost in La Mancha hints at by showing props, costumes, and test footage — may never come to life.